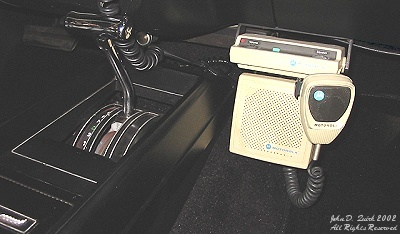 This is the same radio they had in the TV show cars, but mounted in a slightly different position due to our car having the floor shifter. It's a single-channel Motorola Micor. This one is just for looks. If you want it to work, you have to mount the base unit in the trunk and connect the head to it with cables. But who would you talk to?